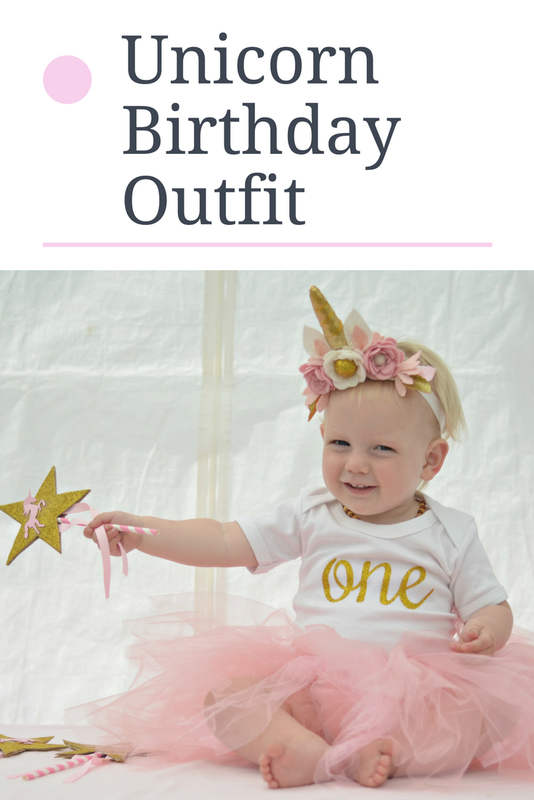 I just love throwing a first birthday party and I can't resist a theme. 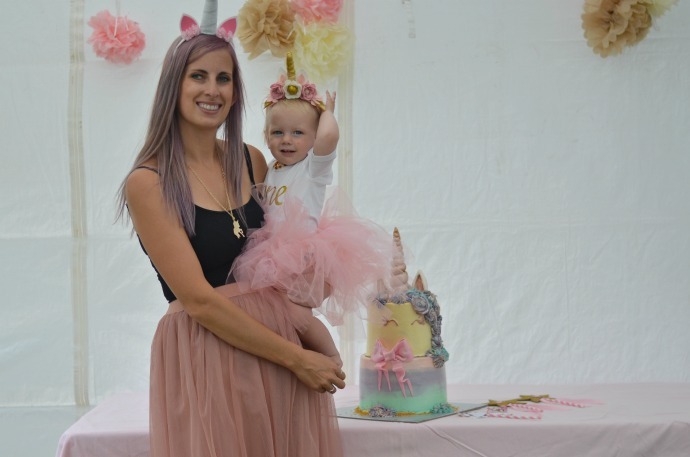 After three boys (who had rainbows, very hungry caterpillar and robot themed parties), I decided that Cora could have a unicorn themed first birthday party and I gave in to all that was pink and sparkly for an afternoon of celebrating with family and friends. We had the party in my parents' garden as they have a lovely big space and a large gazebo that we can all sit under to get out the sunshine. I decorated inside and put tables and chairs in there, and then we had garden toys everywhere for the children as well as a couple of games. 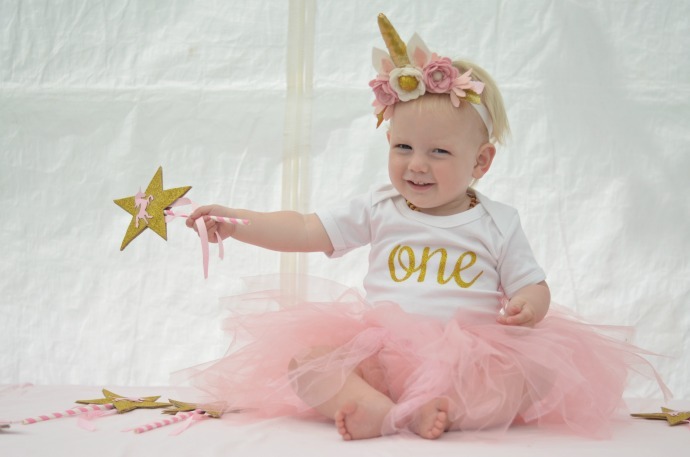 Cora wore a unicorn crown that I ordered from Harper Jade, a one vest with gold writing that I bought from Betty Bramble and a pink tutu that I made myself. It was simple and perfect for the birthday girl and so much more pink than I thought I would be comfortable with! I didn't want to have to cater for everyone properly (we had about 60 guests) so I held the party in the afternoon so that I could just do snacks. 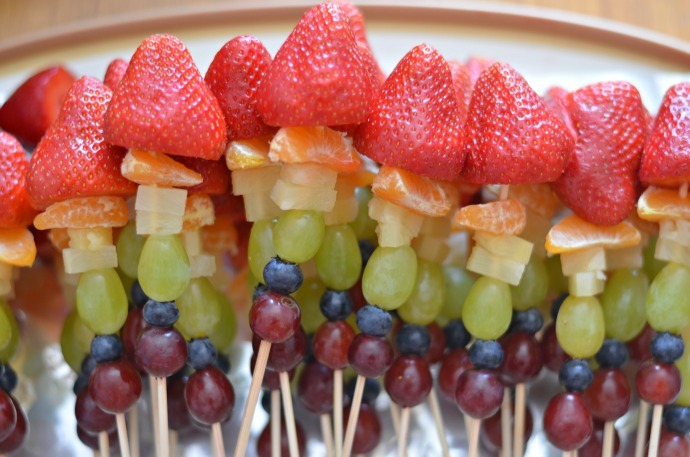 We had cut up vegetables and breadsticks with hummus and rainbow fruit kebabs that my sister helped to make. 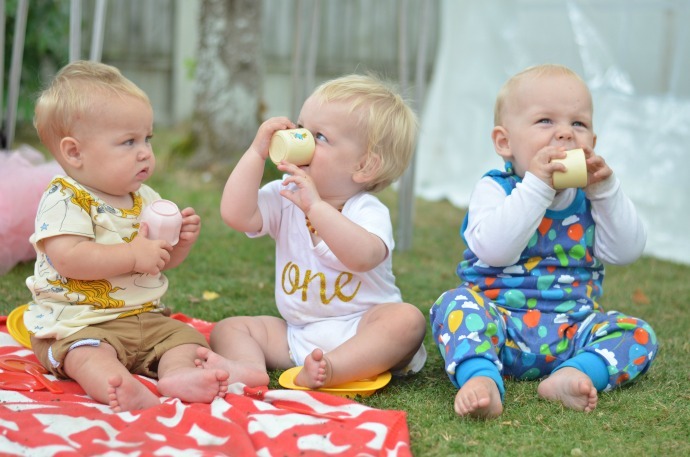 As it was a first birthday party I wanted everything to be suitable for the babies as well. The children played so well, and we did a pinata half way through the party. 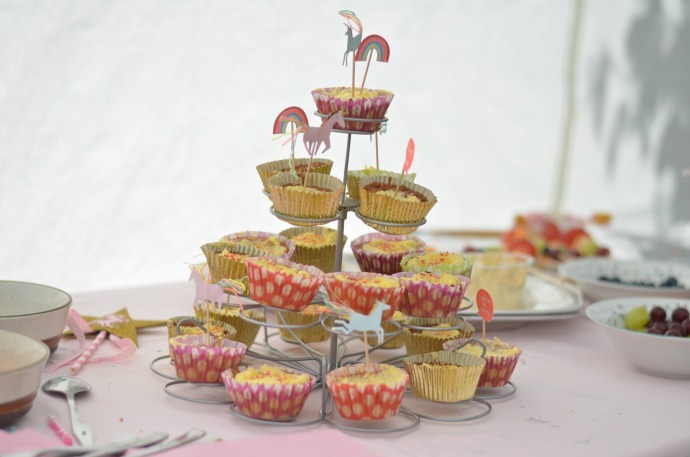 I found a unicorn pinata on Party Pieces and filled it with the bear paws 'sweeties' (or at least that is what I call them for the kids) so that everyone could join in with the game and the prize was suitable for little ones too. 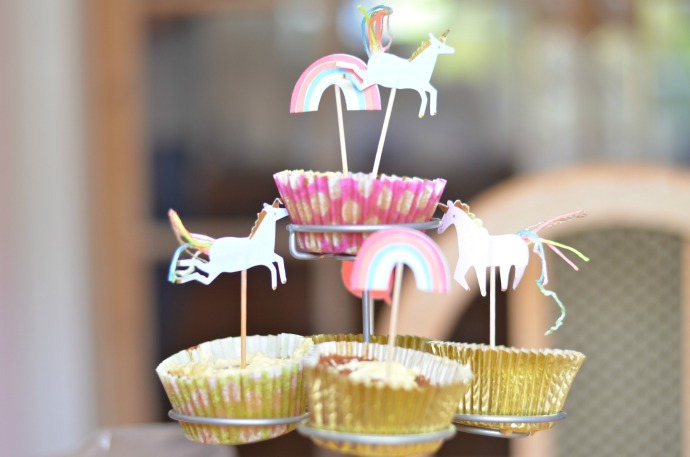 I bought some cupcake sticks from the same website to decorate my homemade cakes as well. For the main cake, I must admit now that I didn't make it. 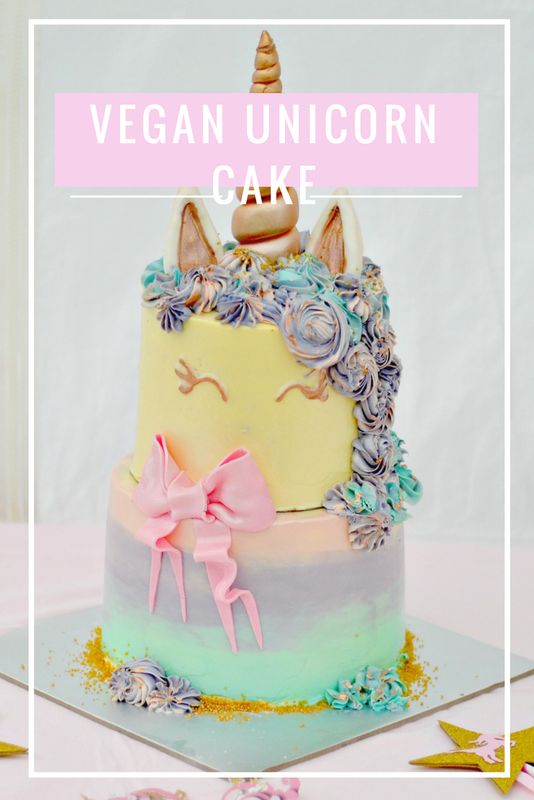 I knew exactly what I wanted and it was just so far beyond my skills that I decided to outsource the cake and I found a local baker who made just the most perfect work of art. 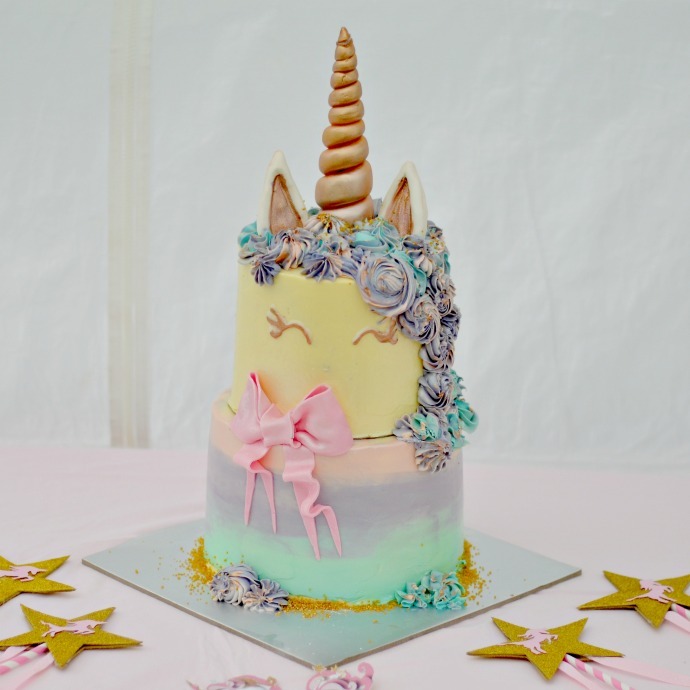 A two tier cake, with 8 layers of rainbow sponge on each tier and stunning unicorn decorations. 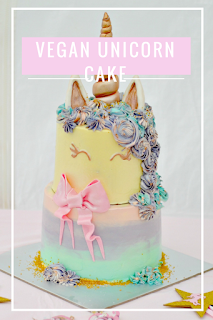 The entire cake was also vegan as I have a lot of vegan friends and this meant that everyone could enjoy it. I dressed up for the party too, in a tulle skirt and headband from Boohoo.com and a unicorn necklace from Claire's accessories. Lots of our guests came in unicorn attire and we even had a brilliant dragon too. I bought Finn some unicorn trousers but completely forgot to get a picture of them! 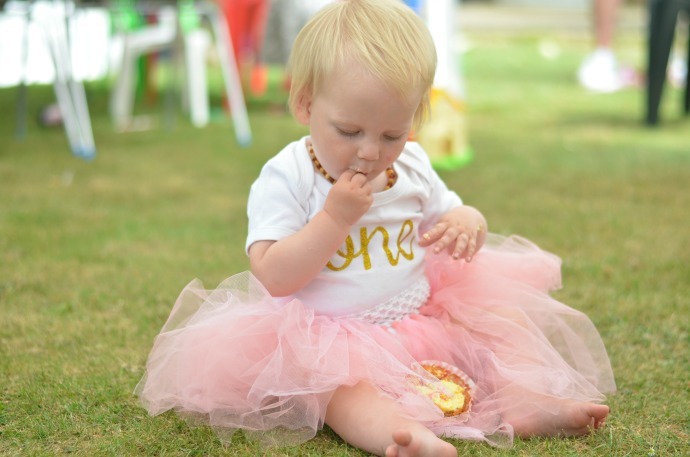 We don't usually let Cora have cake, but at her own party it seemed cruel not to and she definitely enjoyed it! 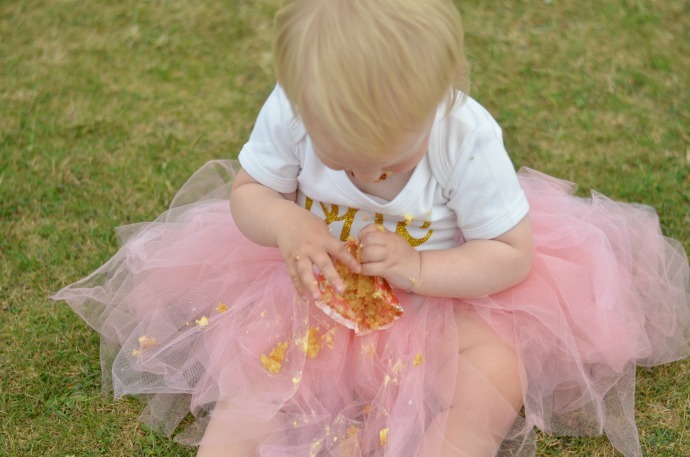 She had a nibble from the main cake and then we let her loose with half a cupcake too. 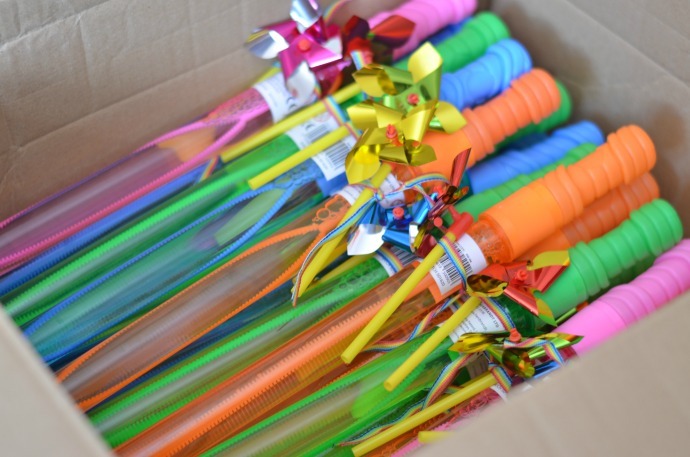 Instead of giving out party bags, all the children that came took home a giant bubble wand with a windmill attached, tied on with rainbow ribbon. I spent a long time trying to think of a unicorn themed party gift that was suitable for 1 year olds all the way up to 6 year olds, but in the end we settled with bubbles. Cora was absolutely shattered at the end of the party as not only was there so much to take in, she also took her first steps that day! As soon as the last guests had left, she crashed out on my parents' sofa whilst we cleared up. 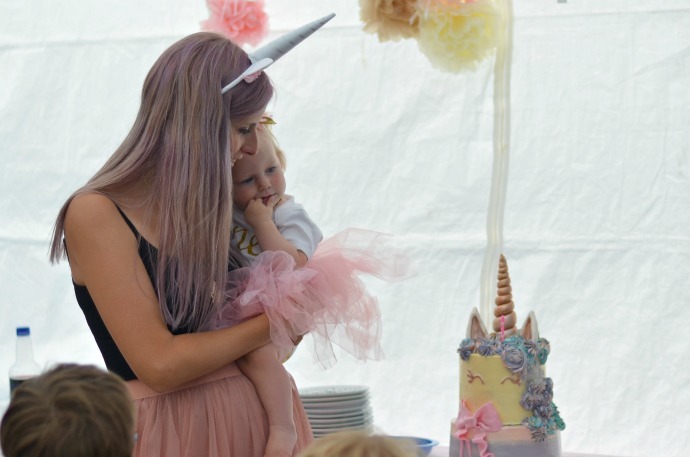 It was such a lovely party and the unicorn theme worked really well. I didn't manage to get many photos as I was busy hosting the party, but I am glad that I managed a few to look back on. I've been looking forward to these pictures and all of the details for so long, and it definitely didn't disappoint! LOVE IT. Also, your baby's friends are really well-dressed..! I spy Duns and Mini Rodini there!! 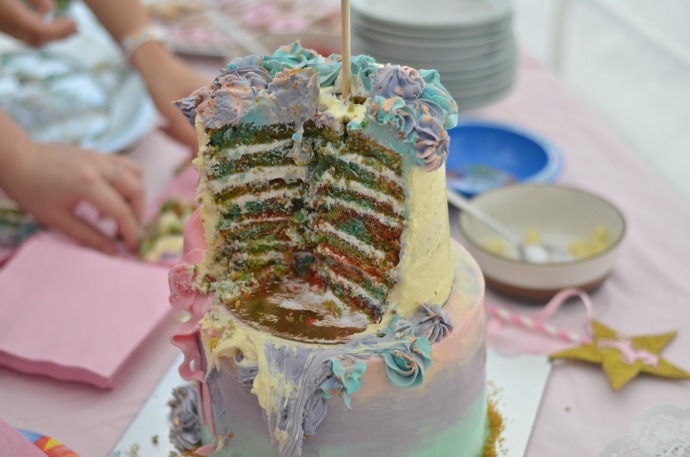 Amazing photographs, stunning cake and awesome theme. Definitely given me food for thought for my baby's first birthday. Beautiful Party! I am currently planning my sons Peter Rabbit themed first birthday and this has made me so excited!